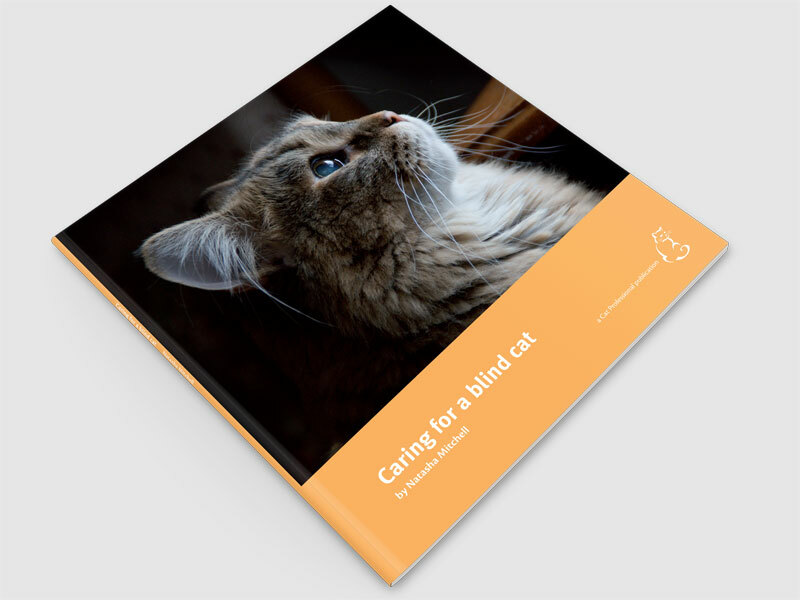 'Caring for a blind cat' has been written as an ideal information source and support tool for cat owners whose cats are visually impaired or blind. A 62 page, fully illustrated book aimed at cat owners and veterinary professionals, launched August 2008. 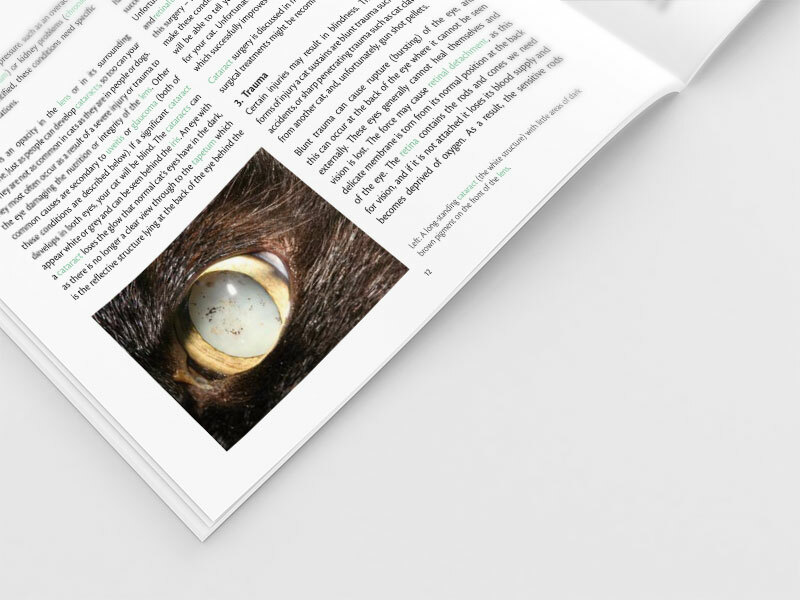 'Caring for a blind cat' has been written as an ideal information source and support tool for cat owners whose cats are visually impaired or blind. It is also helpful to owners of cats with eye problems that may lead to vision problems blindness and would be perfect for a person thinking of re-homing a blind or disabled cat. The book is also designed to be a resource for student vets, veterinary nurses and technicians. The science and emotional aspects of dealing with a diagnosis of blindness are dealt with and the causes and treatments of eye conditions are discussed. The book has practical advice on how to modify the home and garden for blind cats. Case studies are included to show how well blind cats can cope with their disability and Caring for a Blind Cat gives lots of advice to improve the quality of life of your visually impaired cat. 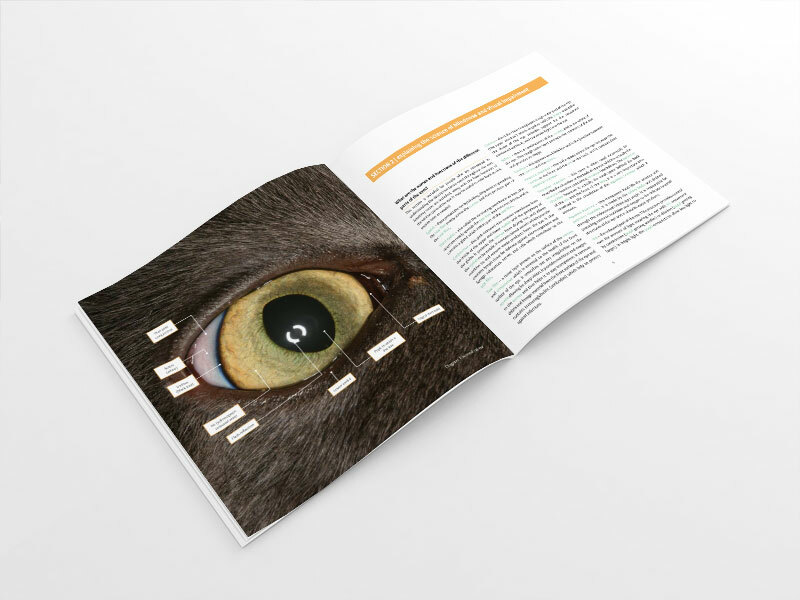 ''Caring for a blind cat” contains comprehensive yet accessible information on the anatomy, diseases and conditions of the eye together with practical step-by-step advice for owners. It addresses both gradual and sudden onset presentations and provides excellent advice on the specific needs and care of the blind cat. The case histories are particularly useful, as it's always good to know you are not alone when tackling a problem!" This book will be of great help and comfort to owners of visually-impaired and blind cats. It is both highly informative and very practical, and the case studies give a real insight to the resilience of cats and their near unending ability to adapt to change (often being far better at it than their owners). I would recommend this book to anyone interested in learning more about blindness in cats. The book is fantastic - really easy to read and packed with information including a useful glossary of veterinary terms. I’ve found it helpful in explaining more about my blind cat’s eye problems and in advising me on how I can make life as easy as possible for her. Caring for a blind cat was a pleasure to read; I found the positive reassurance that this book can give to owners of blind or partially sighted cats quite uplifting... Essential reading for practice staff who have to advise and support owners. This is a 63 page softback, booklet-type publication aimed for the dedicated cat owner and is very much recommended for this special situation. It will also make a worthwhile read for veterinary surgeons, nurses and the dedicated receptionist, being particularly useful to discover ideas for practical home management of cats with poor sight, including tips coming from cat owners. 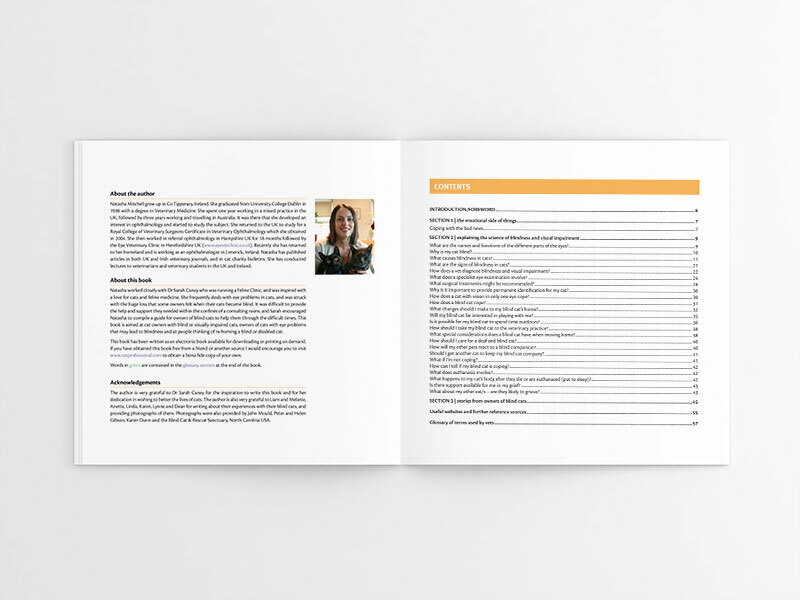 The contents of the book include sections titled: the emotional side of things; explaining the science of blindness and visual impairment; stories from owners of blind cats; and then there is a list of further reference sources and a glossary of veterinary terms. More than half of the book is taken up by the second section on the science of blindness and visual impairment but this title may be misleading for a veterinary audience. Although the early subsections include science, standard veterinary technique and practices involved with veterinary ophthalmology the later subsections are “softer”, including answering such questions as: what changes should I make to my blind cat’s home? Will my blind cat be interested in playing with me? How will my other pets react to a blind companion? This is not to say that these are not useful; on the contrary they will be most useful for owners providing active advice on the practicalities of managing a blind cat at home as well as reassurance about how well such cats usually do. I thoroughly recommend this book; both as a good read for veterinary professions and for any cat owner facing the situation of living with a blind or partially-sighted cat. What are the names and functions of the different parts of the eyes? Why is my cat blind? What causes blindness in cats? What are the signs of blindness in cats? How does a vet diagnose blindness and visual impairment? What does a specialist eye examination involve? What surgical treatments might be recommended? Why is it important to provide permanent identification for my cat? How does a cat with vision in only one eye cope? How does a blind cat cope? What changes should I make to my blind cat’s home? Will my blind cat be interested in playing with me? Is it possible for my blind cat to spend time outdoors? How should I take my blind cat to the veterinary practice? What special considerations does a blind cat have when moving home? How should I care for a deaf and blind cat? How will my other pets react to a blind companion? Should I get another cat to keep my blind cat company? What if I’m not coping? How can I tell if my blind cat is coping? What happens to my cat’s body after they die or are euthanased (put to sleep)? Is there support available for me in my grief? What about my other cat/s – are they likely to grieve? Natasha qualified as a veterinarian in 1998 and has worked exclusively as a veterinary ophthalmologist (eye specialist) for more than ten years. She has written many articles and contributed to several books aimed at veterinary professionals. Natasha currently lives in the Republic of Ireland with her family which includes several cats, and enjoys seeing a mixture of species in her referral veterinary ophthalmology clinic. Natasha’s detailed biography can be found here.